I’m going to have to do a full post on my latest toy over the next couple of days, right now I’m just starting to get to grips with the new settings, hopefully I’ll have some more sample photos and footage to show you soon, so far I’ve just had one session with the camera in very low light and fairly heavy rain, but I can go through the basic features for you here. 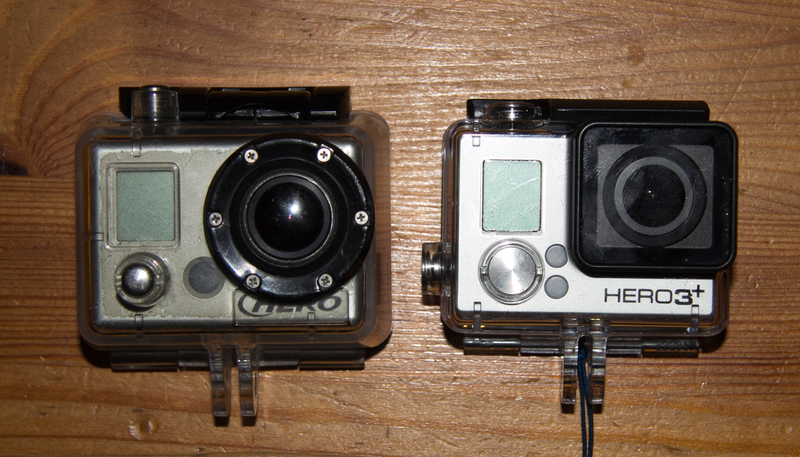 Here’s my original Hero HD camera on the left and the new GoPro Hero 3+ on the right (I sold the Hero 2 to help fund the new camera). Here are my first impressions on the changes and what I like about it compared to the Hero 2 which I have used a lot since it was released, and the Hero 3 Black edition which I haven’t owned myself but I have had the chance to play with several times. The buttons are bigger on the housing – this is a welcome change, but it does come at a price, the housing is now only waterproof to 40m, not 60m, (although it will fit in the original Hero 3 Black edition housing if you want to take it to 60m) for us as surf photographers, this is not an issue. It takes Micro SD cards – I had to buy one especially for this camera, I went for the Sandisk Extreme 32GB UHS-I Class 10 card, it’s currently selling on Amazon for £42 but I paid £36 last week for mine, my guess is that the GoPro launch probably prompted more demand as you really need this high speed card to make the most of the 30 photo’s per second and 4k video features. The Battery lasts longer – Not something I’ve actually noticed yet but it’s a definite benefit over both the previous GoPro cameras I’ve used. The built in WiFi and app work really well, compared to the bulky Hero 2 and WiFi bacPac combo the Hero 3+ performs well and is super lightweight, the new app works well on both my HTC Sensation and Nexus 7 tablet. Low Light video performance is great, it really is awesome for video in low light, which is about half the time for me in the UK, especially as winter’s drawing in. You can’t import 4K footage with Lightroom 4 – this confused me as I thought the files might have corrupted but it turns out the files were fine but Adobe Lightroom 4 doesn’t seem to be able to display them or even import them, I had to copy them across manually – this is a bummer as I use Lightroom to import all my photo’s and footage, I’ll have to test it with Lightroom 5 when I get a chance to see if it’s fixed. The new clasp on the case is hard to open – this is a good thing because there’s no locking latch like on the Hero 3 cases, but it takes some levering with fingertips to pry the thing open. No RAW shooting – it’s jpeg only, so you lose a lot of the post processing leeway and creative options you have with a DSLR shooting in RAW. It’s tiny and easy to use, point and shoot at it’s best – it’s easily small enough to tuck inside the front zip flap on your wetsuit when surfing. You have no control over the settings – ISO, Shutter speed and aperture are decided for you, your creativity takes another hit. No screen as standard – this doesn’t bother me and you can always buy the LCD BacPac if it’s an issue for you. Fiddly controls – scrolling through the menu is a hassle, but on the positive side if you’re shooting stills you can’t change the settings anyway. To go into a bit more detail on the settings, according to Lightroom the aperture is fixed at f2.8, the focal length is 2.77mm, and ther ISO can change from 100 to 400. The longest shutter speed for the 30 shots per second is 1/60th, I imagine this will get a lot faster in good light but all my shots from this evening were at 1/60th, this is nowhere near fast enough to freeze action as you can see, but it at least allows you to get a useable image. Unlike most cameras that allow you to set the ISO yourself it’s not limited to a round number, so while my 60D would be ISO 100 or 200 or 1600, the GoPro might choose ISO 134, or 367, it’s worth noting that the settings are selected for the first frame and remain the same throughout the sequence, which means the trailing 10 shots or so which are underwater are underexposed (in fairly murky UK water in crap light). 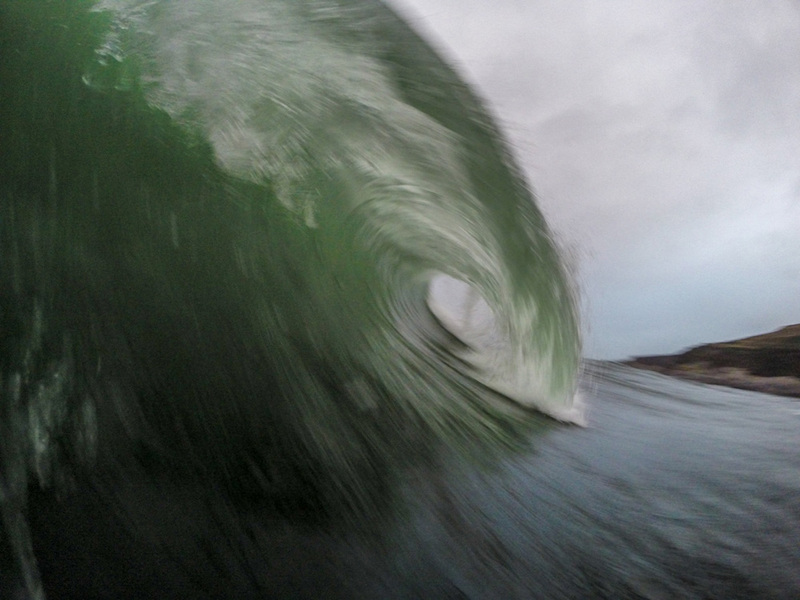 So if you’re starting out in surf photography and want to get into water shooting this is a relatively cheap way to test the water, but if you’ve done enough land shooting to have abandoned the sports mode on your DSLR you will definitely feel a bit limited by the GoPro when taking stills in the waves. Saying that, it’s an awesome video camera and the perfect companion for a DSLR in a housing and at the price of a lens for your DSLR some kind of GoPro Hero 3 or Hero3+ is a no brainer for anyone learning surf photography.